Stampede Meat Inc., a Chicago processor of steaks and other meat products, is voluntarily recalling some 739,000 pounds of vacuum packaged steaks and other meat products that may be contaminated with potentially deadly bacteria, federal health officials said Sunday. 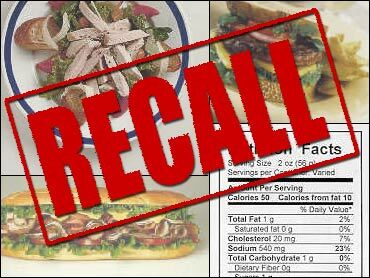 The Agriculture Department's Food Safety and Inspection Service said the products subject to the recall were produced between March 17 and March 22 and bear the establishment code "EST. 19113" inside the USDA inspection mark. The meats were distributed to restaurants, institutions and retail stores nationwide. The products were also sold directly to consumers through door-to-door sales. Additionally, the products were distributed to institutions in Canada. The products may be linked to five to E. coli illnesses in Minnesota, Kansas and Michigan, health officials said. E. coli is a potentially deadly bacteria that can cause bloody diarrhea and dehydration. The very young, seniors and people with compromised immune systems are at greatest risk. Steaks generally are not considered a high-risk source of E. coli. However, the recalled products were injected with meat tenderizers and other chemicals and that process may have introduced the E. coli bacteria to the inside of the product, the FSIS said in a news statement.